I could believe how amazing this place could be. The view from our balcony was just out of this world! Can’t wait to come again next year. We were sooo surprised with how amazing our suite was!! We got the room with the tunnel jacuzzi and it was beautiful. You will meet 2 Dimitri’s at the property that will help sort out your whole stay, from plans, reservations and favors! The welcoming is great and they take such good care of their guests; you will feel so special just staying there. Will definitely be staying there for my next visit. Everything was amazing. Dimitris is an excellent manager. Everything was perfect, breakfast on time , place was incredible. Just perfect. Beautiful room and outdoor jacuzzi. The staff were all so pleasant and courteous. My friends and I were enjoying ourselves in the jacuzzi so much that we forgot the key inside our place. The staff was very friendly enough to come ASAP to let us back into our room. Would recommend without hesitation. Lock in a great price for Hyperion Oia Suites – rated 9.6 by recent guests! One of our best sellers in Oia! 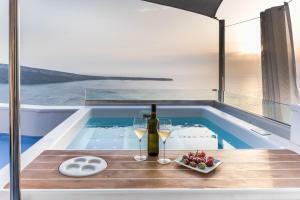 Overlooking the Caldera and the Aegean Sea and perched on a hill in Oia, Hyperion Oia suites offers an outdoor heated pool, outdoor hot tub and a the terrace. Free WiFi is provided throughout. The nearest beach is 1,650 feet away. Modernly decorated, the units feature a living room, bedrooms, a fully-equipped kitchen and bathroom with a shower. The Villa with the private pool has a second bedroom with double bed and an additional bathroom with a shower. Other facilities include a flat-screen satellite TV, air-conditioning, wardrobes, dining table, sofa, safe-box, refrigerator and a dining table. 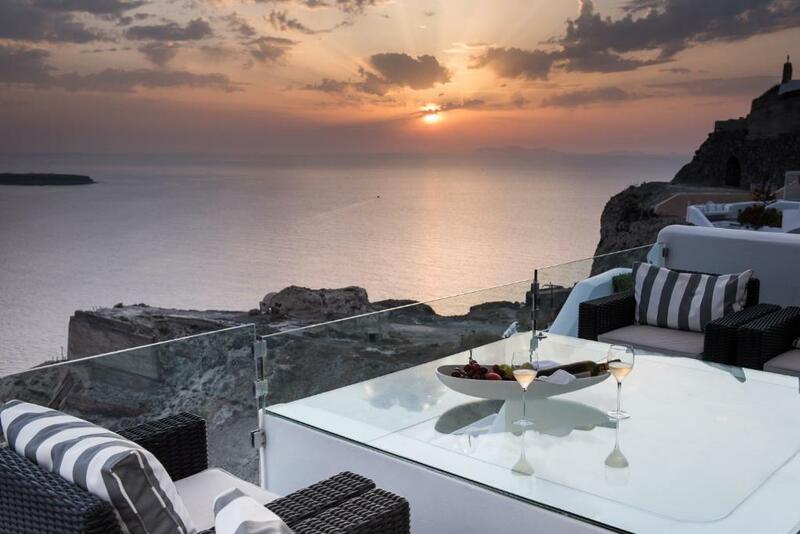 Guests benefit from a seating area and private balcony or terrace with sea-caldera views are provided in each. 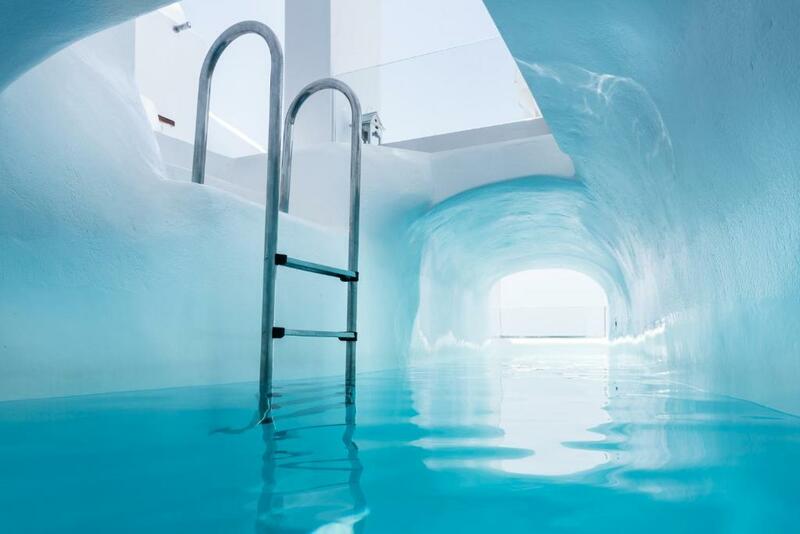 Guests can dove into their own private heated outdoor Cave swimming pool with hydro-massage or enjoy the outdoor large Albatros hot tub with hydro-massage. Breakfast can be served in the privacy of the guestrooms. Santorini Airport and Port is 12 mi from the property. Free public parking is available in the premises. 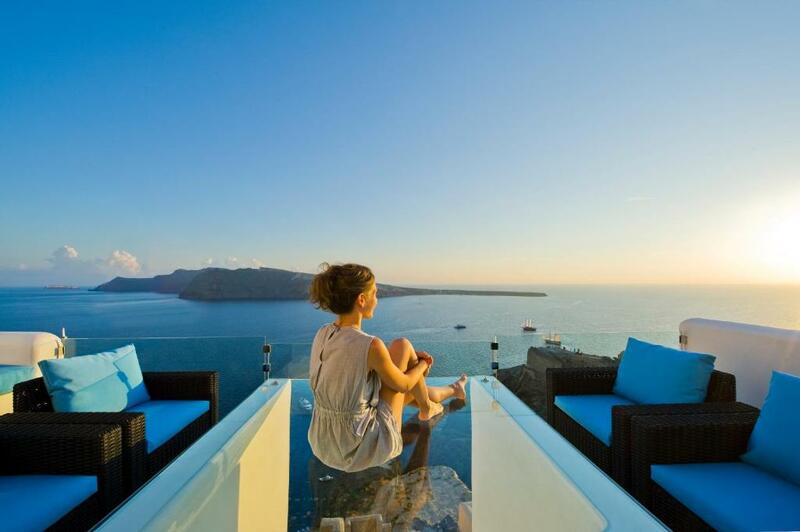 When would you like to stay at Hyperion Oia Suites? This villa features a living room, a dining area and 2 bedrooms. One of them features 1 king size bed and 2 single beds are featured in the second one. Two bathrooms with shower and a WC are also available. It also offers a veranda with a private cave pool and unique sunset-sea view. This villa features a living room, a sitting area, 1 bedroom with 1 double-bed and a bathroom with shower. It also offers a veranda with an outdoor hot-tub and unique sunset-sea view. House Rules Hyperion Oia Suites takes special requests – add in the next step! Hyperion Oia Suites accepts these cards and reserves the right to temporarily hold an amount prior to arrival. Please inform Hyperion Oia Suites of your expected arrival time in advance. You can use the Special Requests box when booking, or contact the property directly using the contact details in your confirmation. Wonderful hotel with the most amazing and famous view! Especially if the sunset! We got upgraded to the heated cave pool with hydro massage which was as excellent as it sounds! Best place to stay in oia! No words can describe how beautiful & charming and everything like heaven the property is amazing. Beautiful room and the view was spectacular! 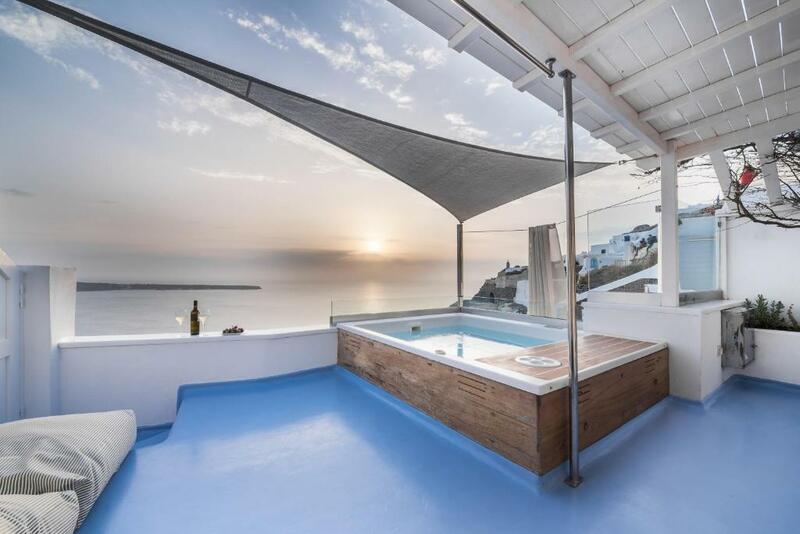 Best views in Oia!! The staff is excellent, friendly and warm. Beautiful cave villa. Love this place !!! Location and stuff is too friendly and helpful and the view is better than expected. Breakfast could be improved in terms of variety and portions. Other than that everything was absolutely perfect! Staying with Hyperion Oia Suites will be the curse of your stay yet, in the same token you would be foolish not to stay at the envy of the island. The views were surreal, something that you see on Instagram or the movies. It has the most romantic view at sunset and the stunning blues of the Aegan Sea will leave you waking up in awe before breakfast and dipping your toes in the jacuzzi before lunch. One would be surprised to find they only setup some 2 - 3 years ago as they run the hotel like experienced hoteliers offering a luxurious experience with staff serving you for your every need from cleaning, breakfast to daily follow up to ensure your ultimate comfort. Just on their warm Greek hospitality alone, I would highly recommend staying with them and we will be back for sure. Expensive but at the end worth every penny. Great location with best private sunset view, incredible stuff like never experienced before (both Dimitris), spacious and clean room, delicious breakfast served on balcony, complimentary wine and snacks... Absolutely exceptional stay! Highly recommended! We visited Hyperion Oia Suites during our honeymoon. Everything from the moment they received us from the airport till the moment we said goodbye was absolutely perfect. The owner, Emmanuel took care of everything for us. The view from our balcony is beyond perfect, probably the best spot in Oia to enjoy the amazing sunset and very private too. The room was always super clean. Each member of the staff was incredible, super friendly and made every effort to ensure we had a great stay. I am so impressed with this location and overall experience. The breakfast is delicious and served in the privacy of our balcony!! I loved the high quality toiletries. A nice local bottle of wine is complimentary. 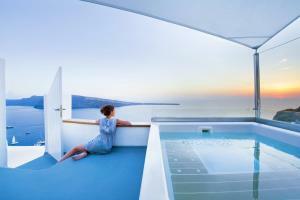 The best hotel in Santorini by far !!! We stayed in Selini suite for 4 night,everything was perfect!